End last year I took a couple of Korean lessons with some of the Nuffies! 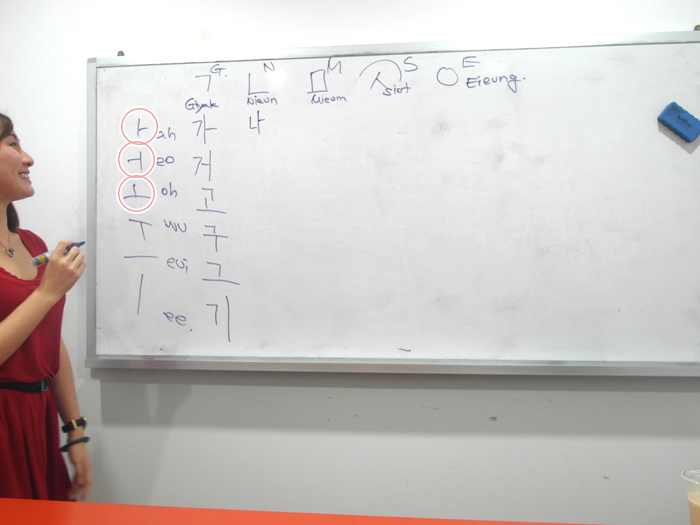 I took the lessons at Hankuk Centre, which is located at Queenstown. Located at my old estate actually, so I know the area pretty well haha. There's a lot of buses that go there! Anyway I realised I've never really tried learning a new language before! I have taken lessons in both French & Mandarin (French is my official second language) of course, but these were both languages I grew up with & weren't totally foreign to me. 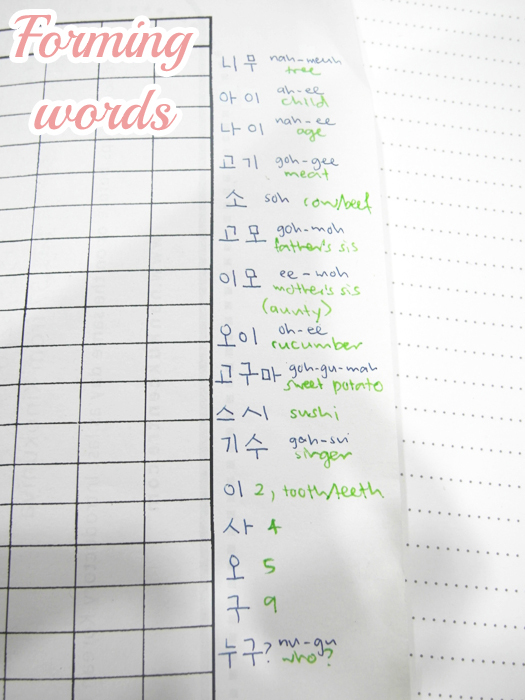 Korean was the first time I was trying to learn a completely new language that I had no prior knowledge of. 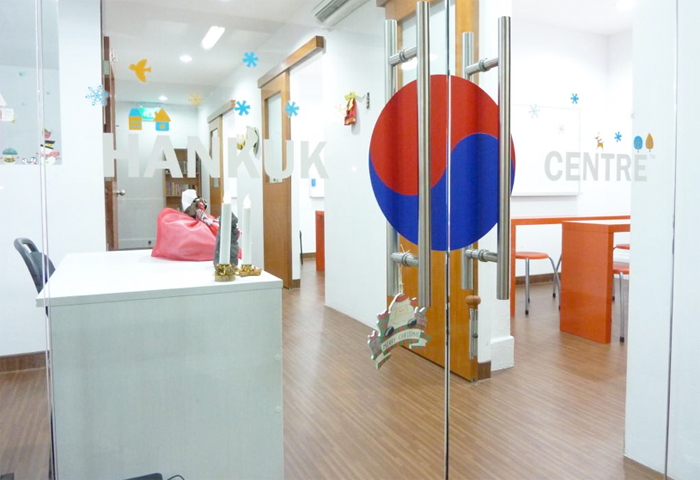 Hankuk Centre will be running a promotion exclusively for my readers! This was the centre when it was decorated for Christmas! ♡ The best teachers. 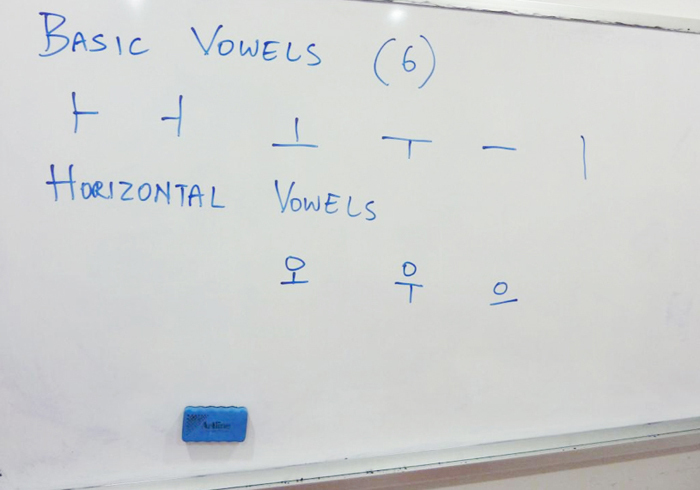 All their teachers are native Koreans, fluent in both English & Korean & with years of teaching experience. You won't have to worry about communication issues! ♡ Small class sizes. 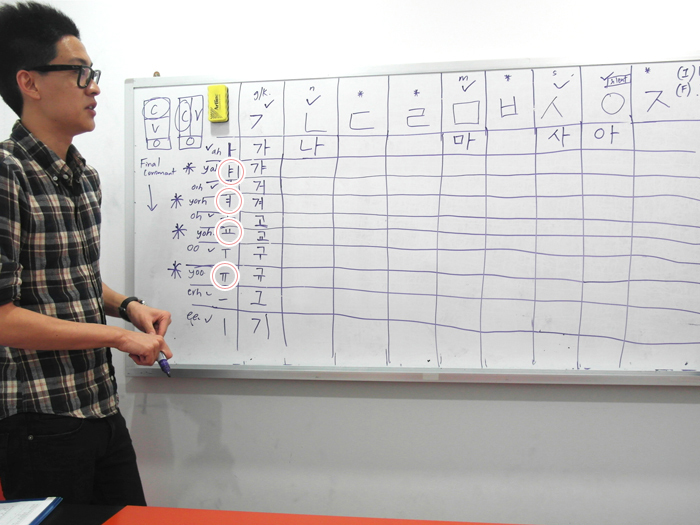 No class is larger than 9 students, meaning you get personalised attention & will be able to participate actively in class & will feel less shy when you're trying to learn Korean! Showing us how to write the characters! The strokes are always from left to right & top to bottom. 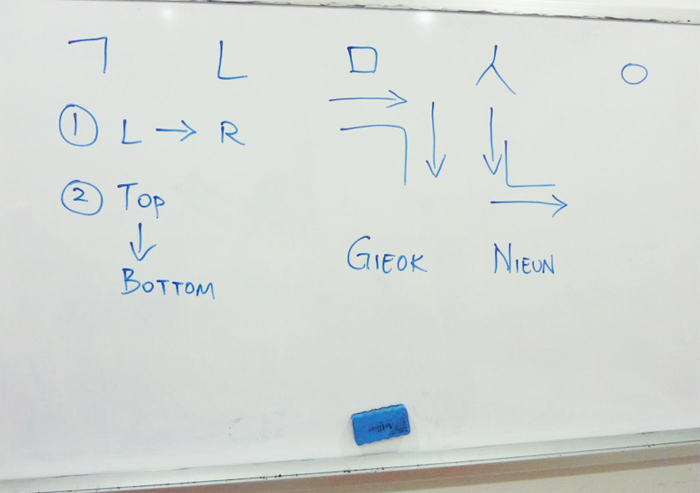 The words "Gieok" & "Nieun" are the names of the characters! The 5 shown in the photo are basic ones. More names of the characters. And here's how you can combine different letters to form words! Since it was our first lesson these were of course basic combinations! Normal Korean words usually consist of 2 or 3 of these letters together. Chris taking his turn at the board. We all took turns to fill in some of the combinations on the board! Very straightforward lah, just combine the two together haha. The difficult part is remembering how it's pronounced! But at least with a small class you'll feel less hesitant to try, especially if you're taking lessons with friends! Like there were 4 of us in total so we formed a whole class on our own haha. Disclaimer: The romanization (spelling) of the Korean characters in the pictures above & below are different (e.g. "Gieok"/"Giyak") as we wrote it differently to make it easier to remember the pronunciation! So the correct ones are in the previous pictures above. So if you combine the 1st in the top row (Gieok, "G" sound) with the 1st in the left column ("ah"), it's pronounced GAH. Quite simple! Just that with increasing number of letters it becomes harder to remember which is what & how each is pronounced! Pronouncing each one after writing them in! Some words you can form already just from the few letters we learnt that day! Turns out I wrote tree (나무) & singer (가수) wrongly! LOL see, eventually you can fill up the whole sheet. That's a lot of combinations leh. Small class sizes! Makes it more conducive for learning compared to large classes where you may easily feel crowded out. I mean it's like in school, I'm a lot less likely to contribute in a class of 30 & may easily get bored/distracted compared to a class of 10. 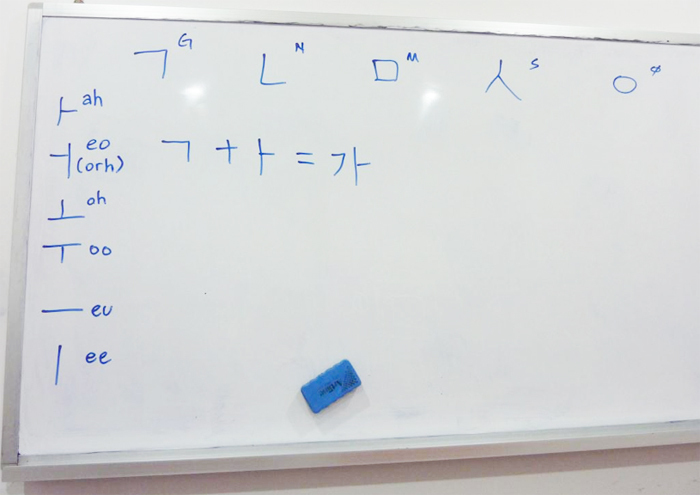 Learning more of the Korean letters! That day we started learning how to combine 3 letters. On the top left you can see how the teacher wrote how the alphabets are combined! Consonant over/with vowel over the final consonant. 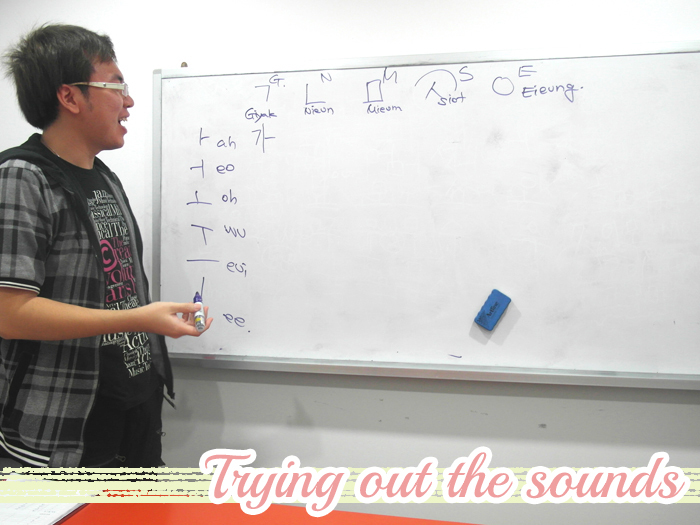 The vowels with 2 lines are pronounced with a Y sound instead! So if it's "ah" with one line, the two-line version is "yah". Took pictures with the teacher! 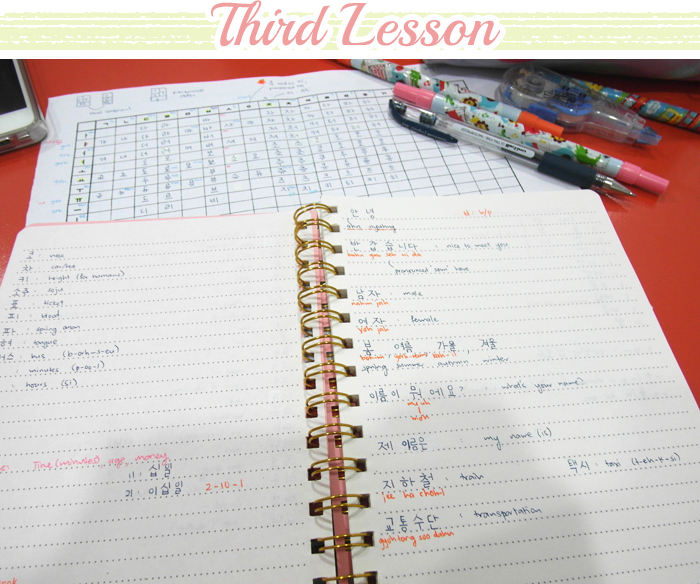 On the third lesson we learnt a lot more stuff! Like the Koreans have two different sets of words for numbers, depending on whether it's for quantity or for time. So e.g. a 4 in "4 apples" is different from the 4 in "4pm"
KOREAN Y U SO COMPLEX?! Was also quite amused to learn how to say "female", because we all remembered hearing Psy say "yoh jah" a lot when he sings Gangnam Style. So yeah it means female haha. Filling up more of the alphabet sheet! The other good thing about small classes is that you can progress differently based on your class' progress. With a smaller group you wouldn't be forced to stick to a standard progression that's to fit everyone in a large group. So with like 4-9 of us in class, if we're struggling & need more time/explanation we can slow down the pace, or similarly speed it up if everyone is coping well. Furthermore if you're lagging it's easier to get attention & help in a small class. This is quite unlikely in larger classes where you might easily fall behind or get frustrated by the delay of slower classmates. At the end of the 3 lessons I think if I have my alphabet sheet on hand I can sorta figure out basic Korean sentences already! I might not know the meaning but I would know how to pronounce them haha. The teachers taught us more important conversational words like "taxi" & "bus" & we would randomly keep asking how to say this & that, so with smaller classes the teacher-student relationship is a lot more casual & personal! 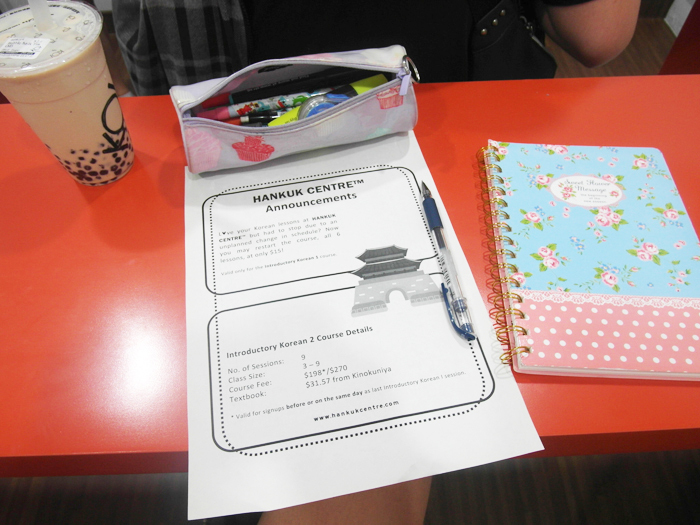 A lot of you actually asked me where I was taking my Korean lessons so if you're interested to pick up Korean, go to Hankuk Centre! 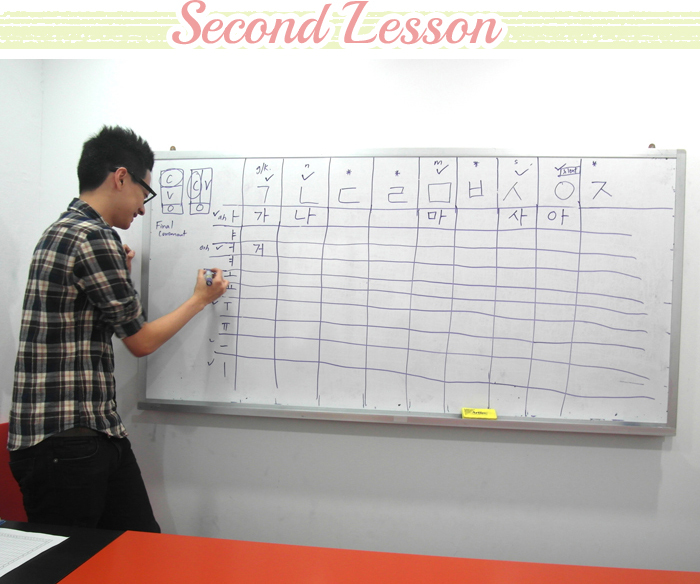 A 1-session complete introductory Korean course conducted exclusively for my readers! 13 comments on "Korean Lessons"
OMG SOAPZ! Remember on ur previous post(very backdated) i was quite keen on korean language and i even ask you stuff about the korean classes you went to but you didnt reply. And now finally, you blogged about it and there's promotion!! You see what i told you, you're always making me broke! And the good thing is there's promo/discounts for ur readers which is always a good thing for us! hahaha another plus point is that the teacher is so handsome!!!!!! Your teacher is super cute! That's another incentive to join the class. hahahaha What's his name? Omg your Korean teacher is so good looking! Unlike mine which is a female one. 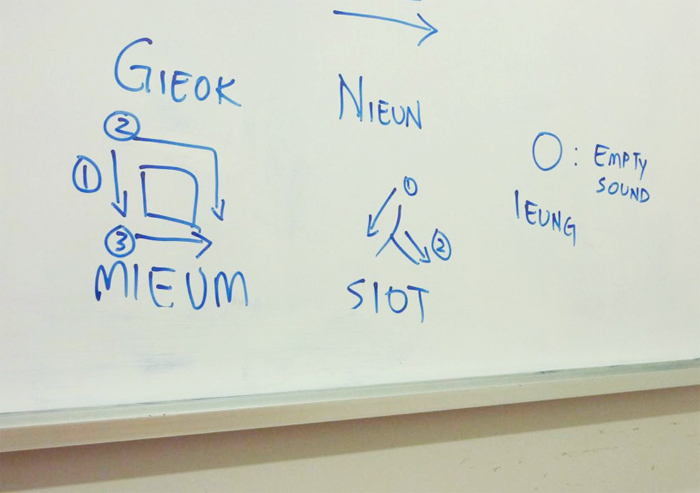 Personally I have been learning the Korean Language for the past 2-3 years. I used to go to a private school like yours too but I quitted and then I self study, took the proficiency exam for Korean, passed the beginner paper and then kinda halted now because I'm too busy with school. Yep like what you mentioned the Sino Korean system and Native Korean system is rather confusing but you will get the hang of it soon. I hope you enjoyed learning Korean! 파이팅! Omg your Korean teacher is so good looking! Wow. Korean seems so difficult! Hi! Where did you get the grey shirt that you wore when you took a pic with the Korean teacher? Omg your teacher is so cute! Makes learning so much better.